Mutations in the canonical transient receptor potential cation channel 6 (TRPC6) are responsible for familial forms of adult onset focal segmental glomerulosclerosis (FSGS). The mechanisms by which TRPC6 mutations cause kidney disease are not well understood. We used TRPC6-deficient mice to examine the function of TRPC6 in the kidney. We found that adult TRPC6-deficient mice had BP and albumin excretion rates similar to wild-type animals. Glomerular histomorphology revealed no abnormalities on both light and electron microscopy. To determine whether the absence of TRPC6 would alter susceptibility to hypertension and renal injury, we infused mice with angiotensin II continuously for 28 days. Although both groups developed similar levels of hypertension, TRPC6-deficient mice had significantly less albuminuria, especially during the early phase of the infusion; this suggested that TRPC6 adversely influences the glomerular filter. We used whole-cell patch-clamp recording to measure cell-membrane currents in primary cultures of podocytes from both wild-type and TRPC6-deficient mice. 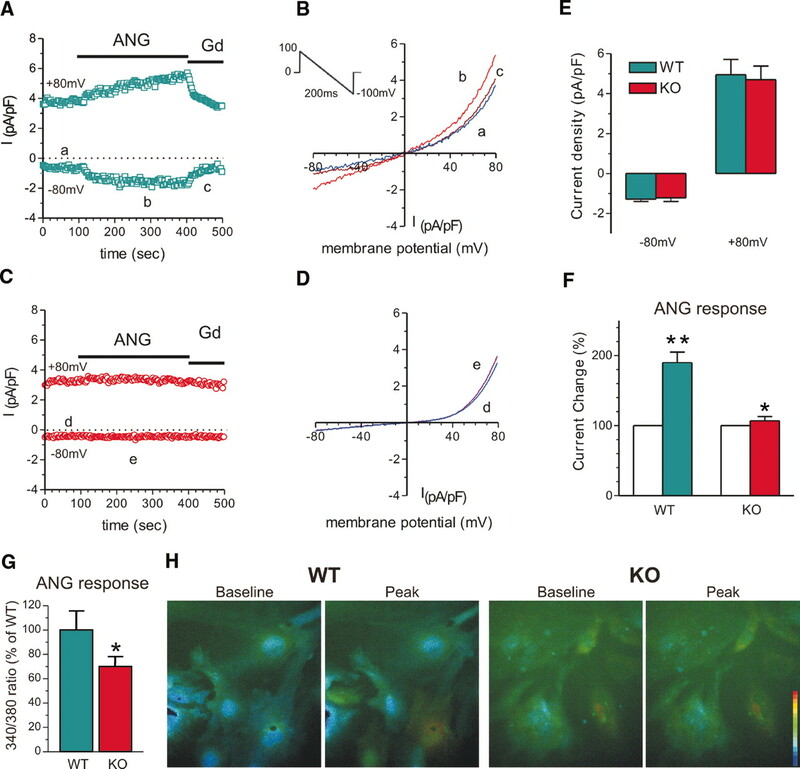 In podocytes from wild-type mice, angiotensin II and a direct activator of TRPC6 both augmented cell-membrane currents; TRPC6 deficiency abrogated these increases in current magnitude. Our findings suggest that TRPC6 promotes albuminuria, perhaps by promoting angiotensin II-dependent increases in Ca2+, suggesting that TRPC6 blockade may be therapeutically beneficial in proteinuric kidney disease. A role for TRPC6 in the kidney was revealed by studies showing that mutations in the TRPC6 gene cause autosomal dominant forms of hereditary focal segmental glomerulosclerosis (FSGS) that are particularly aggressive. We originally reported that patients with the TRPC6 P112Q mutation developed high-grade proteinuria by the third or fourth decade of life, and 60% progressed to ESRD.2 We also found augmented intracellular calcium (Ca2+) influx with TRPC6 P112Q compared with wild-type (WT) TRPC6. Subsequently, seven distinct mutations in TRPC6 have been identified that are associated with adult onset FSGS. The precise causal mechanisms underlying the development of kidney disease caused by mutations in TRPC6 have not been clearly defined. A key role for glomerular epithelial cells or podocytes in the pathogenesis of proteinuric renal diseases has been most clearly established through studies of congenital forms of nephrotic syndrome.3,4 Podocytes are specialized, terminally differentiated cells surrounding glomerular capillaries, forming interdigitating foot processes that contribute to the size and charge barrier of the glomerular filter.5 Podocytes also synthesize basement membrane components, secrete growth factors to maintain glomerular endothelial cells, and provide physical support for capillary loops responding to changes in intraglomerular pressure.5 Podocyte injury impairs these specialized functions, leading to proteinuria and foot process effacement.5,6 Podocyte injury and depletion has been implicated in the progression of diabetic nephropathy7 and FSGS.8 In studies in rat kidney, TRPC6 is found in podocyte foot processes and along the slit diaphragm where it colocalizes with nephrin and podocin.9 Thus, it is plausible that mutations in TRPC6 might cause podocyte dysfunction as a mechanism leading to glomerulosclerosis. The renin-angiotensin system (RAS) plays a critical role in modulating proteinuria and progression of kidney injury.10 Angiotensin II (Ang II) is the major effector molecule generated by the RAS and is pivotal in the progression of glomerulosclerosis.11 In clinical trials, blockade of the RAS with angiotensin-converting enzyme inhibitors and angiotensin receptor blockers slows the progression of renal disease, particularly diabetic nephropathy.12 The pathways triggered by Ang II that contribute to the development of proteinuria and progressive kidney injury are difficult to discern from clinical studies. However, Ang II influences podocyte structure and function, and it has been suggested that these effects may contribute to glomerular pathology. Gloy and coworkers13 showed that exposure of rat podocytes to Ang II caused depolarization and increased intracellular Ca2+. Ang II infusion promotes apoptosis and increases expression of TRPC6. Taken together, these data suggest that one potential mechanism whereby mutations in TRPC6 might contribute to renal disease is by augmenting injurious signals in response to hormonal mediators such as Ang II. Here, we evaluated the contribution of TRPC6 to the maintenance of normal kidney structure and function and to the development of Ang II-dependent hypertension and kidney injury using TRPC6-deficient mice. We find that elimination of TRPC6 has no effect on normal glomerular structure or function and does not affect the severity of Ang II-dependent hypertension. However, proteinuria is attenuated in TRPC6-deficient mice. Baseline measurements of BP (either via telemetry or tail-cuff manometry) revealed no significant differences. Mean arterial pressure as measured by telemetry was: TRPC6+/+, 121 ± 15.75 mmHg, n = 5, versus TRPC6−/−, 119 ± 13.17 mmHg, n = 6 (P = NS) (Figure 1). Additionally, there was no difference in systolic BP (SBP) daily or with diurnal versus nocturnal BP (data not shown). SBP measured by tail-cuff manometry was also similar between the two groups: TRPC6+/+, 115 ± 10.26 mmHg, n = 7, versus TRPC6−/−, 109 ± 9.72 mmHg, n = 8; (P = NS) (Supplementary Figure 1). There was also no difference in albuminuria between the groups at baseline: TRPC6+/+, 25 ± 12.97 mcg/d, n = 14, versus TRPC6−/−, 30 ± 17.49 mcg/d, n = 18. Additionally, there was no evidence of podocyte, mesangial, endothelial, or tubular compartment abnormalities in the TRPC6 knockout (KO) or control mice on light, immunofluorescence, or electron microscopy. Similar mean arterial pressure (MAP) in WT and TRPC6 knockout/null mice. MAP was measured by radiotelemetry. The solid line indicates WT (TRPC6+/+), n = 5; the dashed line shows KO (TRPC6−/−), n = 6. P = NS at all time points. Reverse transcription quantitative real-time PCR was performed on RNA isolated from the kidneys of three TRPC6-deficient and three WT mice at baseline (each experiment was replicated in duplicate at least three times). TRPC6 mRNA expression was absent in all tissues in the TRPC6-deficient mice. 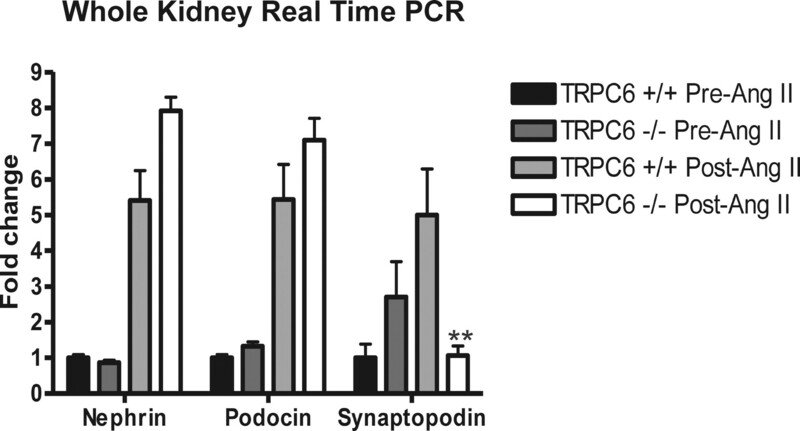 There were no differences in TRPC3, TRPC6, TRPC7, podocin, nephrin, or synaptopodin at baseline. We conclude that the absence of TRPC6 does not affect the maintenance of normal kidney structure function or control of BP, and there is no evidence of changes in mRNA expression. Because there was no effect on baseline kidney structure or function, we next examined whether TRPC6 contributes to Ang II hypertension and end organ damage. After a 28-day infusion of Ang II, mean arterial pressure as measured by telemetry appropriately increased in all mice and was not different between the two groups over the course of the Ang II infusion: TRPC6+/+, 163 ± 20.68 mmHg, versus TRPC6−/−, 160 ± 23.26 mmHg at the end of the infusion (P = NS) (Figure 1). SBP measured by tail-cuff manometry was also similar between the two groups after Ang II infusion: TRPC6+/+, 195 ± 16.72 mmHg, versus TRPC6−/−, 189 ± 29.83 mmHg at the end of the infusion (P = NS) (Supplementary Figure 2). Furthermore, there was no statistically significant difference in the heart-to-body weight ratio after treatment with Ang II: TRPC6+/+, 6.10 ± 0.616 mg/g, n = 7, versus TRPC6−/−, 6.63 ± 1.15 mg/g, n = 18 (P = NS), confirming that there was no difference between BP results from either method used (Supplementary Figure 3). There was a statistically significant difference in albuminuria between the two groups at week 2: TRPC6+/+, 1151 ± 452.43 mcg/d, versus TRPC6−/−, 653 ± 400.04 mcg/d (P = 0.004), and at week 3: TRPC6+/+, 1414 ± 538.69 mcg/d, versus TRPC6−/−, 963 ± 577.46 mcg/d, (P = 0.04) of Ang II infusion. At week 4, there was a difference between groups, but it did not reach statistical significance: TRPC6+/+, 1760 ± 499.89 mcg/d, versus TRPC6−/−, 1287 ± 895.53 mcg/d, P = 0.11] (Figure 2 and Table 1). Trend toward decreased 24-hour albuminuria in knockout compared with wild-type mice. There is a significant difference between wild type and knockout at weeks 2 and 3 of angiotensin II infusion. There was less albuminuria in the KO mice at week 4; however, it was not statistically significant. For WT, n = 14; for KO, n = 18. #P = 0.004; ##P = 0.04. Podocyte injury, segmental and global sclerosis, and collapse were present in less than 1% of glomeruli but present in all animals. The angiotensin II model of renal injury produces a sufficient amount of proteinuria but rarely produces a substantial amount of pathologic change. A total of 11 kidneys were reviewed for pathology in WT animals as compared with 10 in KO animals. 72% of affected glomeruli in the WT mice had focal glomerular injury as opposed to 40% of the KO animals (P = 0.13). 82% of affected glomeruli in the WT animals had podocyte injury (positive stain for desmin) with or without glomerular injury accompanied by parenchymal injury as opposed to 50% of KO animals (P = 0.12). A total of 91% of affected glomeruli in the WT animals had tubular microcysts as opposed to 60% (P = 0.10) of KO mice (Figure 3 and Table 2). Examples of glomerular damage after treatment with angiotensin II. (A and C) Glomerular sclerosis and collapse (white arrows in A) and increased desmin staining in podocytes (C). (B) Normal glomerular staining. (D) Normal desmin staining. There was evidence for changes in TRPC channel transcription by real-time PCR in the experimental animals. Reverse transcription quantitative real-time PCR was performed on RNA isolated from kidney of six KO and six WT mice after Ang II infusion (each experiment was replicated in duplicate at least three times). There was increased mRNA expression of TRPC3 in KO and WT mice, TRPC6 in WT mice and downregulation of TRPC7 in KO and WT mice after Ang II infusion. Podocin and nephrin were upregulated in both KO and WT mice after Ang II infusion (Figures 4 and 5). Interestingly, the only difference observed between the KO and WT mice was a five-fold increase in synaptopodin expression in WT versus KO mice after Ang II (P = 0.008). Upregulation of TRPCs 3 and 6 and downregulation of TRPC7 after angiotensin II treatment. Real-time PCR was used to evaluate mouse kidney tissue. (+/+ is TRPC6 wild type and −/− is TRPC6 knockout). Upregulation of nephrin and podocin and downregulation of synaptopodin in knockout mice (TRPC6 −/−) after angiotensin II treatment. Real-time PCR was used to evaluate mouse kidney tissue. **P < 0.01 in knockout (−/−) versus wild type (TRPC6 +/+). To characterize podocyte membrane currents (ITRPC6), nonselective cation currents were recorded using whole-cell patch clamp technique from podocytes isolated from WT and KO mice, and we found no difference in basal currents between WT and KO podocytes (−0.75 ± 0.2 pA/pF at −80 mV and 3.39 ± 1.3 pA/pF at +80 mV, n = 5, versus −0.91 ± 0.16 pA/pF at −80 mV and 3.04 ± 0.9 pA/pF at +80 mV, n = 7, respectively). The current-voltage relationship for currents recorded from both WT and KO podocytes demonstrated an outwardly rectifying current with a reversal potential of 0 mV consistent with a nonselective current. However, the addition of Ang II (10 μM) to the podocytes resulted in a significant increase (195% for −80 mV and 185% for +80 mV) in the ITRPC6 current amplitude in wild-type podocytes (Figure 6). Some podocytes failed to respond to Ang II (one of 16 cells for WT versus eight of 23 cells for KO podocytes). Only cells that were responsive were used in the statistical analysis (a total of 15 for each type). We also corroborated the effects of Ang II on podocytes by imaging Ca2+ transients using the Fura-2 method. Ca2+ signals from WT podocytes stimulated with Ang II (100 μM) were quite small (not shown). We therefore substituted BaCl2 for CaCl2 in the extracellular solution, as was done in the electrophysiology experiments, to increase the magnitude of the Ang II responses. We found that the fluorescence increases in response to Ang II were significantly smaller in KO as compared with WT podocytes: TRPC6+/+ = 100% versus TRPC6−/− = 69.9 ± 0.085%, P < 0.05; WT, n = 32, and KO, n = 47. Reduced angiotensin II-generated membrane currents (INSC) and Ca2+ signals in TRPC6 KO podocytes. (A) An example of membrane current recorded from a WT podocyte. The current was induced by a 200-ms voltage ramp protocol (1 mV/ms, from 100 mV to −100 mV, holding potential 0 mV, see inset) every 3 seconds. INSC was normalized by membrane capacitance. The current measured at −80 mV. Note that the current was increased after Ang II (ANG, 10 μM) perfusion and inhibited by gadolinium (Gd, 10 μM). (B) Examples of I/V relation of membrane currents in the WT podocyte. The letters a through c correspond to the traces in A. (C) An example of membrane current recorded from a TRPC6 KO podocyte. The recording protocol was same as above. Note that the current was not increased by Ang II. (D) Examples of I/V relation of membrane currents in the KO podocyte. The letters d through f correspond to the traces in C. (E) Group mean values of INSC at −80 mV and +80 mV in WT (green bars, n = 29) and TRPC6 KO podocytes (red bars, n = 22). There is no significant difference between WT and KO podocytes. (F) Group mean changes (%) of INSC at −80 mV caused by perfusion of Ang II (ANG 10 μM) in WT and TRPC6 KO podocytes. Ang II nearly doubled INSC in WT podocytes (green bar, n = 16, **P < 0.01), whereas Ang II slightly increased INSC in TRPC6 KO podocytes (red bar, n = 23, *P < 0.05). (G) Group mean Ca2+ increases (% of WT) produced by Ang II (100 μM) in WT (green bar, n = 32) and TRPC6 KO (red bar, n = 47) podocytes. The magnitude of the TRPC6 KO Ca2+ response is 69.9 ± 0.085% of the WT response (*P < 0.05). (H) Examples of Ca2+ signals produced by Ang II in WT and KO podocytes. The pseudocolor scale (bar) is from 340/380 ratio 0.1 to 1.0. Note that ANG produced a larger Ca2+ increase in WT than in KO podocytes. To further examine the TRPC6 function in podocytes, we measured whole-cell currents from WT and KO podocytes using the diacylglycerol analog, 1-oleoyl-2-acetyl-sn-glycerol (OAG) (100 μM) to directly activate TRPC6 channels. ITRPC6 was significantly enhanced by the addition of OAG to WT compared with KO podocytes (234% for WT versus 154% for KO). The current-voltage relationship displayed a linear current with outward rectification consistent with the TRPC channels. 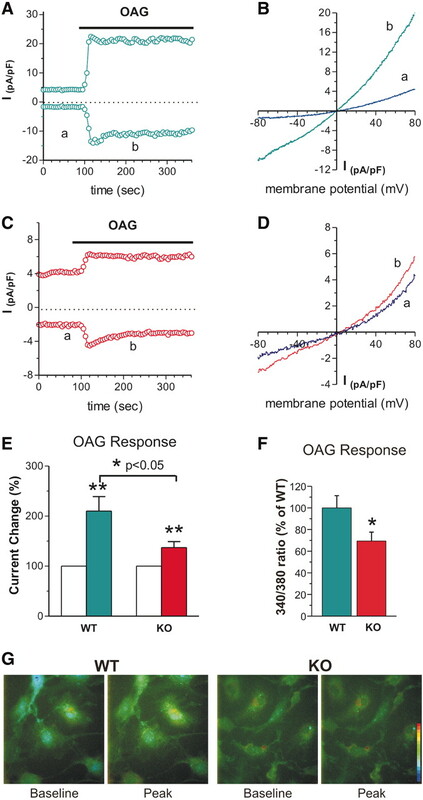 Interestingly, the addition of OAG (100 μM) to Fura-2-loaded podocytes led to a robust Ca2+ transient that was significantly greater for the WT podocytes compared with KO podocytes (Figure 7). Ion selectivity and pharmacologic studies of this nonselective current in podocytes were used to gain further details about the role of TRPC6 channels. The putative TRPC6 current was permeable to Na+ and was readily blocked by the addition of gadolinium (10 μM; Figure 1), features characteristic of TRPC nonselective currents. In particular, replacement of Na+ with N-methyl-D-glucamine greatly reduced the current in WT podocytes by 60% and shifted the reversal potential to −40 mV (Supplementary Figure 4). When these studies are considered together, it is apparent that podocytes lacking TRPC6 failed to activate the nonselective cation currents typical of TRPC6 in response to Ang II. These results strongly support the conclusion that the Ang II-stimulated nonselective currents recorded from primary mouse podocytes result from TRPC6 channels. Membrane currents (INSC) and Ca2+ signals in response to OAG stimulation are reduced in TRPC6 KO podocytes. (A) An example of membrane current recorded from a WT podocyte. The current was recorded as described above. The current measured at −80 mV and +80 mV. Note that the current was increased after OAG (100 μM) perfusion. (B) Examples of I/V relation of membrane currents in the WT podocyte. The letters a and b correspond to the traces in A. (C) An example of membrane current recorded from a TRPC6 KO podocyte. The recording protocol was the same as above. Note that the current was also increased by OAG but less than that in WT cells. (D) Examples of I/V relation of membrane currents in the KO podocyte. The letters a and b correspond to the traces in C. (E) Group mean changes (%) of INSC at −80 mV caused by OAG (100 μM) in WT and TRPC6 KO podocytes. OAG doubled INSC in WT podocytes (green bar, n = 16; **P < 0.01), whereas the increase was attenuated by 37% in TRPC6 KO podocytes (red bar, n = 23; *P < 0.05). (F) Group mean Ca2+ increases (% of WT) produced by OAG (100 μM) in WT (green bar, n = 58) and TRPC6 KO (red bar, n = 59) podocytes. The magnitude of the TRPC6 KO response is 69.4 ± 0.082% of the WT response (*P < 0.05). (G) Examples of Ca2+ signals produced OAG in WT and KO podocytes. The pseudocolor scale (bar) is from 340/380 ratio 0.1 to 1.0. Note that OAG produced a larger Ca2+ increase in WT than in KO podocytes. Mutant variants of TRPC6 have been discovered in families from diverse ethnic backgrounds with hereditary FSGS. Several of the TRPC6 mutations cause an increase in Ca2+ transients across the cell membrane.9,14 Additionally, TRPC6 has been found to be upregulated in other kidney disorders.15 This would suggest that it may be useful to modify the effects of TRPC6 and that an inhibitor may be beneficial. To explore the effects of such, understanding the implications of TRPC6 deficiency is essential. Here, we have examined the ramifications of TRPC6 gene deficiency before and after a well-established mouse renal injury model. We first considered the possibility that a loss of function may lead to kidney disease because previous reports revealed elevated BP as well as increased smooth muscle cell contractility.16 However, phenotyping of the TRPC6-deficient mice, once inbred onto the 129/SvEv background, revealed no adverse effects on kidney structure or function. The original analysis of the TRPC6-deficient mouse was done on a mixed background of C57/BL6 and 129/SvEv. There are strain and gender differences in the susceptibility to hypertension and kidney disease in mouse renal injury models.17 It has been suggested that there are quantitative trait loci that affect BP and albuminuria between C57/BL6 and 129/SvEv mice. It has become increasingly clear that C57/BL6 mice are an inferior model for the study of renal injury models in mice.17–19 Furthermore, the suggestion that TRPC3 would be sufficiently upregulated in TRPC6 deficiency to cause increased Ca2+ flux and hypercontractility of smooth muscle cells is difficult to explain. Generally, in vivo compensation when there is a lack of protein function is just that, not overcompensation. In human disease attributed to TRPC6 mutations, differences in BP have not been reported before the onset of renal disease. There is mounting evidence for the role of increased TRPC6 activity in vitro and in vivo in human proteinuric kidney diseases.15 TRPC6 expression was also increased in various podocyte cell culture studies, using complement and puromycin to induce injury. These damaged podocytes demonstrated increased Ca2+ influx in response to OAG. This suggests that increased activity of the TRPC6 channel is harmful. This can either be with gain of function as seen in some familial forms of FSGS or with increased activation of wild-type TRPC6.15 Therefore, genetic manipulation of TRPC6 in animal models will allow better understanding of the podocyte intracellular processes that are involved in renal injury. This was a careful phenotypic examination of baseline renal histomorphology, BP, and albuminuria. Life span and fertility were not different between KO and WT litter mates. There was no evidence of differences between either the KO or WT mice. The lack of a renal phenotype in TRPC6-deficient mice is critically important if a gain of TRPC6 function is detrimental to the kidney. In fact, because the TRPC6-deficient mice did not seem to differ from the WT in any obvious way, they were an ideal model to evaluate renal disease. As mentioned above, Ang II, acting through its AT1 receptor, plays a critical role in the generation of proteinuria and in the progression of kidney injury in a number of kidney diseases, including FSGS.10 AT1 receptors, when stimulated, release internal Ca2+ stores and activate Ca+2 entry from the extracellular space via a G-protein-dependent mechanism.20 Therefore, we hypothesized that mice deficient in TRPC6 would be protected from Ang II-induced kidney injury because of a reduction in injurious Ca2+ signaling. Thus, after a 28-day infusion of Ang II using osmotic mini-pumps, we found a statistically significant difference in albuminuria at weeks 2 and 3 of the experiment. Pathologic damage was seen in rare glomeruli at the end of the 28-day infusion. However, in the affected glomeruli that were seen, WT mice had more pathologic changes consistent with renal injury when compared with kidneys from the TRPC6-deficient mice. It is important to emphasize that the differences in albuminuria and renal injury seen in this study cannot be attributed to BP differences. Before treatment with Ang II, the TRPC6-deficient and WT mice had similar BP. Furthermore, during treatment with Ang II, BP increased appropriately and similarly in both groups. In addition, both groups had similar heart-to-body weight ratios at the conclusion of the infusion, confirming that there was no difference in hemodynamic stress caused by Ang II between groups. This is highly significant because there were comparable increases in BP yet still a decrease in albuminuria in the TRPC6-deficient mice. 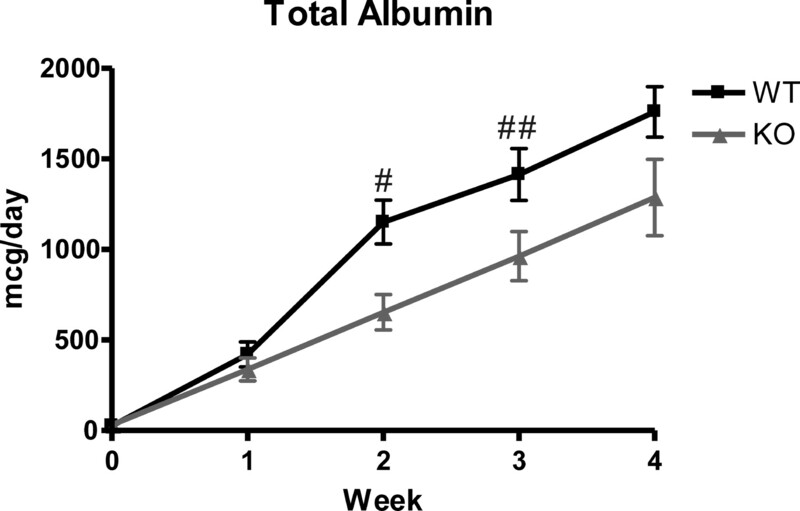 At week 4, there was less albuminuria in the KO mice, but it did not reach statistical significance. There may be several explanations for the lack of significance at this time point. Ang II was given at a very high dose, and at 4 weeks, the mice may have been overwhelmed because of the amount of drug used, resulting in a similar pattern of injury in both groups, albeit delayed in the KO mice. Further examination of the slope of rise in albuminuria from weeks 2 to 4 show similar increases in both groups of mice. Therefore, renal disease is progressing in the KO mice in response to large doses of Ang II, but the protection provided by TRPC6 deficiency may exert its effect early on, thereby causing a delay in proteinuria. A very interesting outcome of this study is that there are no significant differences in nonselective cation currents in either WT or KO podocytes at baseline. However, after stimulation with Ang II, podocytes lacking the TRPC6 gene had no response, whereas those with TRPC6 had increased Ca2+ currents, suggesting that a possible mechanism for the protection of TRPC6 deficiency may be the lack of reaction to the injurious signals of Ang II. Furthermore, the nonselective currents recorded from primary mouse podocytes appear to result from TRPC6 channels (being the only difference between the two types of podocytes used). These observations provoke additional questions, as well as potentially providing a possible response to some recurrent questions surrounding TRPC6 as a cause for hereditary FSGS. TRPC6 may be a much more important signaling mechanism in podocytes than previously known and less important in other tissues. An example of this would be the widespread distribution of ACTN4 in body tissues but the primary expression of mutations of ACTN4 being FSGS.9 This suggests that further investigation into this cellular process may elucidate the injurious mechanism that results from sustained activation of TRPC6. In our model of Ang II-induced renal injury, we were able to show upregulation of TRPC3, 6, and 7 mRNA in response to Ang II as well as nephrin and podocin. Previously, it was thought that TRPC3 and TRPC7, structurally similar to TRPC6, would demonstrate increased expression in models of TRPC6 deficiency and attenuate any effect of the loss of TRPC6. We found an upregulation of TRPC3 in wild-type and KO mice, an upregulation of TRPC6 in WT mice, and downregulation of TRPC7 in both KO and WT mice after Ang II treatment. However, in contrast to what was seen with nephrin and podocin, synaptopodin mRNA expression was decreased after Ang II in the KO mice, whereas it was upregulated in the WT mouse kidneys. To date, seven TRPC6 mutations have been described, yet only four have demonstrated increased Ca2+ flux, suggesting a gain of function. Thus, it can be argued that this may not be the only mechanism of injury caused by TRPC6 mutations and to extrapolate these findings to all diseases associated with abnormalities in the TRPC6 gene may be premature. However, it is currently not known how this ion channel causes glomerulosclerosis, but the mounting evidence pointing toward harmful intracellular effects caused by increased cation flux is difficult to ignore. This belief is not only as a mechanism of renal disease but certainly prevalent in various models of cardiac hypertrophy.21,22 We have demonstrated here that the lack of TRPC6 is not harmful because these mice have no phenotypic difference from their WT litter mates. Therefore, pharmacologic TRPC6 blockade is a reasonable therapeutic option. TRPC6 may have other intracellular interactions apart from ion flux that have not been elucidated at this point. In summary, this study provides evidence that the TRPC6-deficient mouse model is useful to study renal disease. We found no differences in BP, albuminuria, renal injury, or survival in TRPC6-deficient mice compared with WT. Thus, the use of these mice to determine a potential beneficial role in the blockade of TRPC6 in various conditions is plausible. We also demonstrate indirect evidence that a gain of function of TRPC6 is harmful and involved in renal injury. Compared with the TRPC6-deficient mice, those with a normal TRPC6 gene showed increased signs of renal injury manifested by increased albuminuria. This raises the question as to the benefit of TRPC6 blockade in renal disease associated with high Ang II levels. Increased expression of WT TRPC6 has been shown in various studies of acquired renal diseases, such as membranous nephropathy, FSGS, and minimal change disease.15 Our findings are consistent with gain-of-function pathophysiology for TRPC6 mutations in FSGS and suggest that activation of TRPC6 channels in podocytes, with consequent increases in Ca2+ flux, contributes to the development of albuminuria. Specific blockade of TRPC6 may be beneficial in proteinuric kidney disease. This mimics the effects that have been found with the use of angiotensin-converting enzyme inhibitors and angtiotensin-1 receptor blockers. The determination of the role of TRPC6 in glomerular function may eventually enable clinicians to better treat not only FSGS but also other glomerular diseases where there is evidence for TRPC6 upregulation. TRPC6-deficient mice were generously provided by Dr. Lutz Birnbaumer.16 The targeted mutation in the Trpc6 gene was back-crossed onto the 129/SvEv background for more than six generations using mice that were purchased from Taconic (Hudson, NY). The absence of TRPC6 protein in Trpc6−/− animals was confirmed by Western blot analysis and revealed no detectable TRPC6 protein expression (Supplementary Figure 1). The mice used in the experiment were 12- to 14-week-old males weighing 20 to 25 g. The animals were bred and maintained at the animal facility of Duke University Medical Center under local and National Institutes of Health Guidelines. The experiments conformed to the protocol approved by the Institutional Animal Care and Use Committee at Duke University. BP was measured in conscious mice by radiotelemetry using TA11PA-C10 transmitters (Data Sciences International, St. Paul, MN) as described previously.23 Briefly, the mice were anesthetized with isoflurane, and a pressure-sensing catheter was implanted into the left carotid artery. The transducer unit was then inserted into a subcutaneous pouch along the right flank generated by blunt dissection inferiorly from the original neck incision. The mice were allowed to recover for 7 days after surgery to regain their normal circadian rhythms before experiments were initiated. During BP measurements, the mice were housed in a monitoring room in the animal facility where quiet is maintained, and no other activities are permitted. Eleven mice (six TRPC6−/− and five TRPC6+/+) were used for radiotelemetry studies. After recovery from surgery (7 to 14 days), BP and heart rates were measured six times/min, 24 h/d continuously (in conscious, unrestrained animals) with the first week of measurements used as baseline data. Telemetric data for the entire 28 days was collected continuously and stored for analysis by Dataquest A.R.T. software (Transoma Medical, St. Paul, MN). A 28-day infusion of Ang II at a dose of 1000 ng/kg/min (Sigma-Aldrich) dissolved in sterile saline was performed using appropriately primed osmotic mini-pumps (Alzet model 2004; Alza Corp., Mountain View, CA). The pumps were implanted subcutaneously in the dorsal region under isoflurane anesthesia (3%). After a recovery period of 3 to 4 days, BP and 24-hour urine albumin was determined as described below. Twenty-four-hour urine collections were obtained on individually housed mice weekly, using the MMC100 metabolic cages (Hatteras Instruments) with free access to water and food. After collection, urine was immediately centrifuged for 3 minutes (13,000 × g) to remove contamination, and the supernatant was stored at −80°C before analysis. Albuminuria was determined by ELISA (Albuwell; Exocell Inc., Philadelphia, PA), and creatinine was measured using the alkaline picrate method (The Creatinine Companion; Exocell Inc., Philadelphia, PA). After 28 days of Ang II infusion, mouse hearts were harvested and weighed (by the same individual for consistency), and the heart-to-body weight ratio was calculated. The kidneys were fixed in formalin and embedded in paraffin. Three-micron-thick sections were obtained and stained with periodic acid-Schiff. The sections were evaluated by a renal pathologist blinded to the genetic background of each animal. The total number of glomeruli was calculated in each specimen. For measure of glomerular damage, the number and percentage of glomeruli with segmental sclerosis or collapse and global sclerosis or collapse were also calculated. Sclerosis was defined by accumulation/solidification of the glomerular tuft and was not accompanied by podocyte hyperplasia and hypertrophy. Collapse was defined by segmental or global wrinkling and folding of the capillary walls with occlusion of the glomerular capillaries and hypertrophy and hyperplasia of overlying podocytes. Renal parenchymal damage, manifested as the presence or absence of microcysts (dilated tubules), was also evaluated. The amount of tubular microcysts was semiquantitatively calculated in a scale from 0 to 3+ (0 = zero or one microcyst; ± = ≥2 and ≤5 microcysts in the entire renal parenchyma; 1+ = one to five microcysts in five cortical fields at 40×; 2+ = six to ten microcysts in five cortical fields at 40×; 3+ > ten microcysts in five cortical fields at 40×). Immunohistochemistry was performed on formalin-fixed, paraffin-embedded tissues using polyclonal goat anti-mouse desmin (Santa Cruz Biotechnology, Santa Cruz CA). In brief, the sections were deparaffinized in xylene (three changes), rehydrated through graded alcohols (three changes 100% ethanol, three changes 95% ethanol), and rinsed in distilled water. Antibody incubations and detection were carried out at 37°C on a NexES instrument (Ventana Medical Systems, Tucson, AZ) using Ventana's reagent buffer and detection kits unless otherwise noted. Tissue sections were digested with alkaline endopeptidase for 6 minutes at 37°C. Endogenous peroxidase activity was blocked with hydrogen peroxide. Desmin was diluted 1:800 in PBS and incubated overnight at room temperature. Primary antibody was detected with biotinylated horse anti-goat (Vector Laboratories, Burlingame, CA) diluted 1:200 and incubated for 30 minutes. After secondary antibody application, streptavidin-horseradish-peroxidase conjugate was applied. The complex was visualized with 3,3-diaminobenzidene and enhanced with copper sulfate. The slides were washed in distilled water, counterstained with hematoxylin, and then dehydrated and mounted with permanent media. Smooth muscle cells and mesangial cells were used as internal controls for the staining. The number and percentage of glomeruli with positive staining in podocytes was calculated in each specimen. Untreated TRPC6-deficient and WT mice were sacrificed, and kidneys were harvested under sterile conditions. Decapsulated glomeruli were isolated from gently ground kidneys of individual mice by sequential washing with ice-cold PBS through 180-, 100-, and 71-μm sieves (Retsch Inc., Newtown, PA). The fraction collected on the 71-μm sieve was placed on ice, and an aliquot was examined under the microscope to ensure that the solution contained mainly glomeruli. After washing in ice-cold PBS, the glomerulus-concentrated pellet was resuspended in Roswell Park Memorial Institute (RPMI) medium supplemented with 10% FBS and 1:100 penicillin/streptomycin (Tissue Culture Core Facility, Duke Comprehensive Cancer Center, Durham, NC) and cultured in a type I collagen flask (BD Biosciences, San Jose, CA) in a 37°C incubator with 5% CO2 for 3 to 5 days. The flasks containing the glomeruli were undisturbed until sufficient growth was noted around attached glomeruli. Old media containing unattached glomeruli were replaced with fresh media to facilitate growth toward confluency. The products were isolated by passing trypsinized outgrowing cells from the glomeruli through a 40-μm nylon cell strainer (Fisher Scientific, Norcross, GA) and were then cultured in RPMI supplemented medium in a type I collagen flask. Podocytes were split upon reaching 95% confluency. The validation of the exclusive presence of podocytes was routinely confirmed by standard fluorescence immunohistochemistry approaches using Wilm's tumor-1 antibody (Santa Cruz Biotechnology, Santa Cruz, CA). Reverse transcription-PCR was done to exclude other glomerular compartment cells such as mesangial (Thy-1) and endothelial cells (TIE-1). Additional podocyte markers were used as well to confirm the cell type such as podocin, nephrin, and synaptopodin (see methods below). Podocytes showed classical cobblestoning and arborized cell shape, as well as intermediate features between these two types, depending on the passage number. Experimental studies were conducted within the first two to four passages of the podocyte subculture that were arborized. Total RNA was manually extracted from freshly cultured kidney tissue in TRPC6-deficient and WT litter mates using an RNeasy® mini kit (Qiagen, Valencia, CA). Tissue was stabilized in RNAlater® solution (Ambion, Inc., Austin, TX) immediately after sacrifice of the mouse. Subsequently, 0.5 μg of total RNA was reverse transcribed into complementary DNA (cDNA) using the reverse transcription system (Promega Corporation, Madison, WI) with oligo(dT) primers, according to the manufacturer's protocol. The cDNA was diluted two-fold for the real-time PCR. Quantification of mRNA by real-time PCR was performed using the ABI 7900 HT system (Applied Biosystems, Foster City, CA). PCRs for β-actin, synaptopodin, podocin, nephrin, and TRPC3, 6, and 7 were performed in a final volume of 10 μl, consisting of 2 μl of cDNA, 2.5 μl of RNase, and DNase free water, 0.5 μl of 20× TaqMan® gene expression assays (Table 1) and 5 μl of TaqMan® 2× PCR Mastermix (both Applied Biosystems, Foster City, CA). The target DNA was amplified during 40 cycles of 50°C for 2 minutes, 95°C for 10 minutes and 15 seconds, and 60°C for 1 minute. Each individual experiment was performed three times, in duplicate. Relative expression of the target genes was compared in TRPC6-deficient and WT mice and was analyzed by normalizing to the housekeeping gene β-Actin. Patch-clamp experiments were performed to record currents in the whole cell mode using a MultiClamp-700A amplifier with Digidata 1322A interface and analyzed with pCLAMP software (Axon Instruments) as described previously except primary wild-type or knockout podocyte cell lines were used.2 The patch pipettes had a resistance of 2 to 3 MΩ when filled with pipette solution contained 140 mM cesium aspartate, 5 mM NaCl, 1 mM Mg-ATP, 10 mM HEPES, 10 mM 1,2-bis (o-aminophenoxy) ethane-N, N, N′, N′-tetra acetic acid (BAPTA), and pH 7.3. The external solution contained 140 mM NaCl, 2.8 mM KCl, 2 mM BaCl2, 1 mM MgCl2, 10 mM HEPES, 10 mM glucose, pH 7.4. In some experiments, the NaCl in external solution were replaced by N-methyl-D-glucamine/HCl. The currents were induced by a 200-ms voltage ramp protocol (1 mV/ms, from 100 mV to −100 mV) every 3 or 5 seconds from a holding potential of 0 or −60 mV. The experiments were performed at room temperature (20 to 22°C) with a sample rate of 4 KHz (filtered at 2 kHz). The currents were measured at −80 and +80 mV and normalized by membrane capacitance. To measure podocyte Ca2+ signals, primary podocyte cultures were imaged using Fura-2. Podocytes were loaded with Fura-2AM (1 μM; Molecular Probes/Invitrogen) in RPMI containing 10 mM HEPES, pH 7.4, for 30 minutes at room temperature, washed, and incubated for 30 minutes in dye-free RPMI containing 10 mM HEPES, pH 7.4. The imaging experiments were carried out in Ringer solution containing 140 mM NaCl, 2.8 mM KCl, 2 mM CaCl2, 2 mM MgCl2, 10 mM glucose, and 10 mM HEPES, pH 7.4. All of the experiments were carried out at room temperature. In experiments to measure responses to Ang II, CaCl2 was replaced with BaCl2. Ang II (100 μM) or OAG (100 μM) was added as indicated. The responses to Ang II were measured 20 minutes after the addition of Ang II, and the responses to OAG were measured 2 minutes after the addition of OAG. For fluorescence imaging, podocyte cultures were mounted on a Nikon TE2000 inverted microscope equipped with a Photometrics CoolSnap camera, a xenon arc lamp, and a lambda DG-4 rapid filter changer (Sutter). Image acquisition, analysis, and processing were carried out using Metafluor/Metamorph software (Molecular Devices). The images were acquired using a 40× S Plan 1.3 n.a. objective. Fura-2 fluorescence was measured by alternate excitation at 340 and 380 nm and emission at 510 nm. The background subtracted Fura-2 intensity at 340 and 380 nm was used to calculate the 340/380 ratio for all of the individual cells in each field. All of the BP and albuminuria values were expressed as means ± SD. All of the real-time PCR values were expressed as fold changes ± SD using the 2−ΔΔCT method.26 All of the genes were initially normalized to the housekeeping gene β-Actin, and each gene was then expressed as a fold change in relation to its baseline before treatment with Ang II (P0). ANOVA was used to calculate the overall P value for all weeks to calculate a group effect and time effect of albumin, diurnal, and nocturnal telemetry, daily BP via telemetry (mean arterial pressure and systolic BP), and weekly tail-cuff manometry (systolic BP). A value of P < 0.05 was considered statistically significant. Pathology statistics were analyzed using the Fisher's Exact test. Funding was from National Institutes of Health Grant 5R01DK74748-5 (MPW) and the Mandel Foundation. We would like to thank the personnel of the Center for Human Genetics core facilities and especially the family members of the Duke FSGS project. We thank Dr. Yi-Ju Li and Ms. Miao Yu from the Biostatistics Core of Duke Translational Medicine Institute funded by Grant Number UL1RR024128 from the National Center for Research Resources National Institutes of Health for statistical support.